OpenShot Video Editor is a free, open-source video editor licensed under the GPL version 3.0. OpenShot can take your videos, photos, and music files and help you create the film you have always dreamed of. Easily add sub-titles, transitions, and effects, and then export your film to DVD, YouTube, Vimeo, Xbox 360, and many other common formats. What really sets OpenShot apart from other video editors is the easy-to-use user interface. 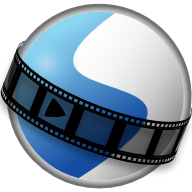 OpenShot has many great features, such as trimming and arranging videos, adjusting audio levels, transitions between videos, compositing multiple layers of video, chroma-key / green screen effect, and support of most formats and codecs. Digital video effects, including brightness, gamma, hue, greyscale, chroma key (bluescreen / greenscreen) , and many more! OpenShot provides extensive editing and compositing features, and has been designed as a practical tool for working with high-definition video including HDV and AVCHD .